My biggest advice to a new vegan would be to refrain from focusing on everything you can’t eat, and to start thinking about all the wonderful fruits and vegetables you can eat! As someone who has been a vegetarian/pescatarian for many years, I never thought I would be able to fully become a vegan. The idea of no more cheese on and in everything, or no omelets for breakfast sounded like torture. Despite my lovely connection to these foods, I gave them up instantly once I decided to become a vegan. This was an impulsive overnight decision, and I had no game plan to properly execute it. As a result, I was forced to learn how to cook for myself or starve. I chose cooking! What helped me remain a vegan was the love of cooking that arose from this lifestyle change. I became obsessed, in the best way, with making vegan food and figuring out a new breakfast, lunch, and dinner regimen. And now you can, too! 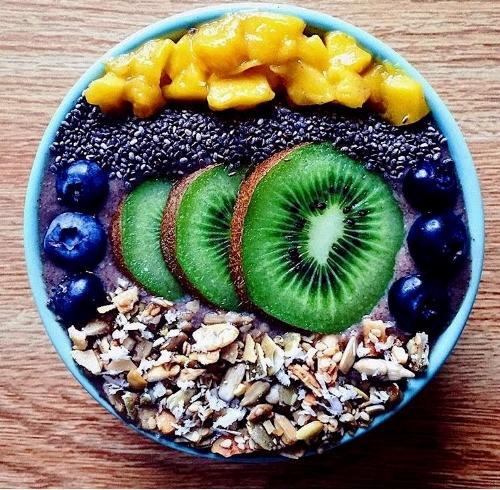 When I have the time, my breakfast of choice is a smoothie bowl. This filling and refreshing morning treat is packed with essential vitamins and nutrients to kick start my mornings. I always make sure my smoothie bowls are bright, colorful, and beautiful because it enhances my enjoyment of the food and makes for great photos. My typical vegan lunch or dinner consists of grilled vegetables and a side of rice and beans. Rice and beans make for a great complete protein, so I eat it almost every day. Whenever I am preparing vegetables I always try to contrast the textures and colors. It helps me appreciate what all these foods bring to the table. I cook my brussels sprouts, carrots, and sweet potatoes in the oven so I don’t have to tend to them constantly. Low-maintenance cooking is my favorite so the oven is a go-to. I always sauté my mushrooms in a frying pan with coconut oil, salt and black pepper. When I cook with a lot of vegetables, I try not to over season anything. A good rule of thumb is to use no more than two additional seasonings apart from the essential salt and black pepper. I always cook my brussels sprouts in olive oil to give it a crunchy texture and season it with thyme and salt. I season the multicolored carrots also with thyme, but I cook it in coconut oil to soften it up. I also cook my sweet potatoes in coconut oil and season it with paprika, cayenne pepper, and salt. I just cook the rice and beans with a little salt to balance out the flavorful veggies!